The artists in this exhibition live and work in Glasgow. They all consider painting to be central to their practice. Although there are some common concerns within the group there is no single unifying aspect to their work, or 'theme' to the exhibition. Each artist is unique, 'making their own rules' through painting. GoMA has worked closely with the artists, selecting the works, discussing the ideas and generating the texts associated with the show. This is the first group show of Glasgow-based painters at GoMA and rather than a comprehensive survey it is a focused selection, bringing out some of the complexity, subtlety and variety of this art form. Neil Clements Michael Fullerton Lotte Gertz Charlie Hammond Louise Hopkins Merlin James Andrew Kerr Victoria Morton Carol Rhodes Tony Swain Hanneline Visnes George Ziffo. For this exhibition I contributed with The work “All In Coagulating Colour” it consists of 8 oddly shaped wood panel, oil paintings, ranging in size between 20x30 cm and 40x50cm . 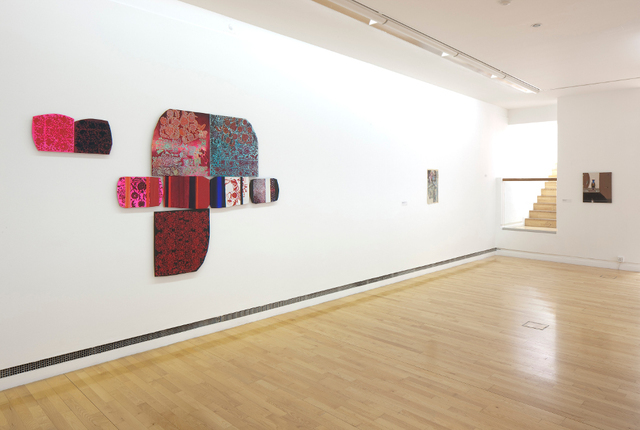 Each panel is an individual painting of detailed patterns overlapping each other, and shifting bright colours. The panels are placed together in a formation, by doing so I was seeking to intensify the colours and the patterns by playing them against each other. The overall impression of this work is as if it is one large painting, by placing the small paintings together in a shape I wanted to explore the possibilities of combining the bombast and authority of a large painting, whilst retaining the intensity and intimacy of a small paintings. My paintings are usually small scale, falling outside the tradition of large scale “Macho” paintings – in this work I was seeking to explore the possibilities working larger holds whilst retaining the usual small scale of my motifs and marks.